This post has been sponsored by Sargento. As always, all thoughts and opinions are my own. Crustless Quiche Lorraine is an incredibly easy gluten free quiche that’s perfect for casual brunches or a quick weeknight dinner. So what’s a brunch loving girl to do? Make Crustless Quiche Lorraine, that’s what. 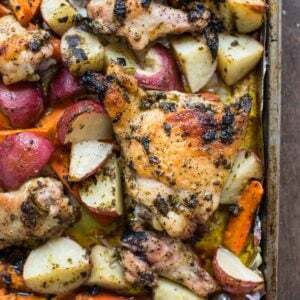 This recipe delivers big time flavor in an incredibly speedy package. 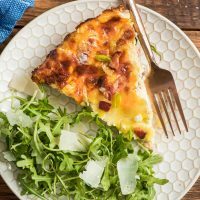 Quiche Lorraine is rich, bacony, cheesy egg goodness that can be whipped up and in the oven before your sweet babe lets out his first tell tale whimper. 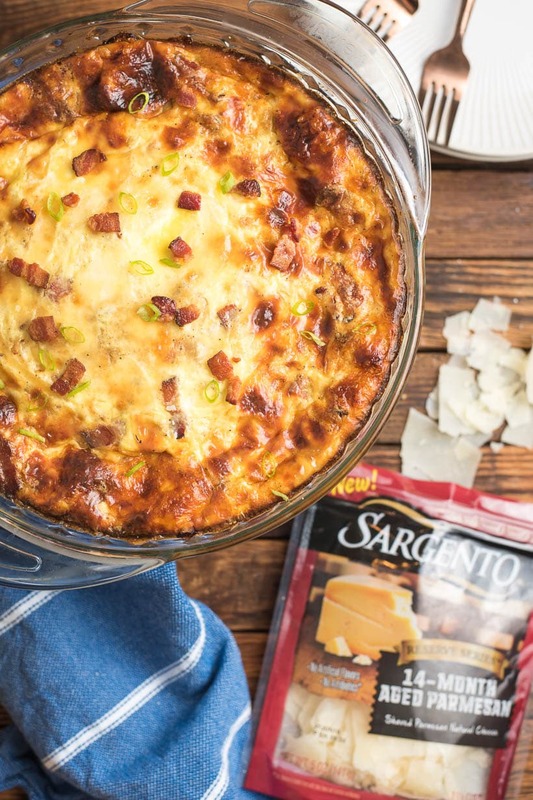 Like traditional Quiche Lorraine, this one is packed with bacon, onions, and Sargento® Shredded Swiss cheese. However, this crustless version gets its buttery umami flavor from the addition of Sargento® Reserve Series™ 14 Month Aged Parmesan. Aged cheeses are known for their superior flavor (it’s the secret to my Creamiest Mac and Cheese!). In this recipe, Sargento’s big hearty shavings of Parmesan stand in for a traditional crust. Parmesan gives this quiche an irresistibly golden exterior and so much flavor you won’t miss the crust at all! 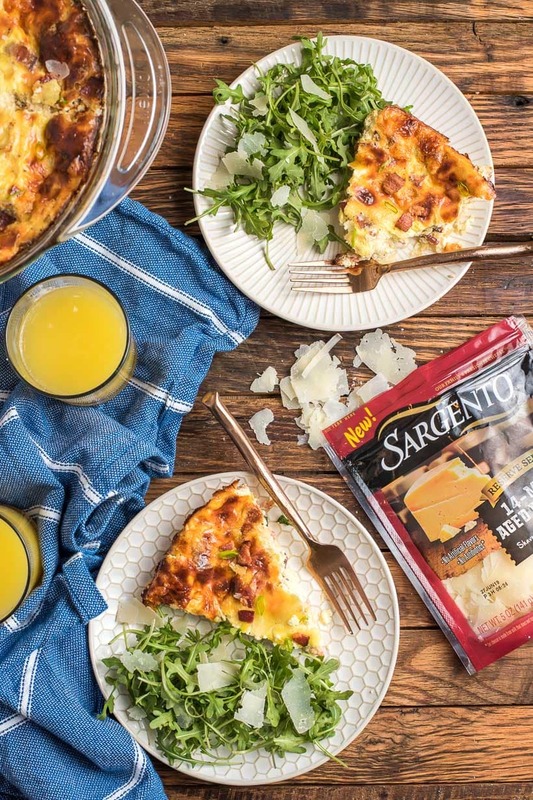 Right now, you can save $.75 cents off 1 Sargento Shredded Cheese Package at Meijer with this mPerks Offer. Ditching the crust means not only is this a naturally gluten free quiche recipe, but it’s also an absolute breeze to make. Start by frying up some bacon. Pro tip: Use scissors to cut your bacon into bite sized pieces before frying. Pre-cut bacon fits better in the pan and cooks more evenly. Remove the bacon from the skillet along with all but 1 Tablespoon of the bacon fat. Here’s where things get really good. Add the onion to the bacon fat and let it cook until it’s nice and soft and golden brown. These humble onions will be transformed into sweet smoky morsels that flavor the whole quiche. While the bacon and onion are cooking, you can mix up the custard. Whisk together eggs and half and half (feel free to use heavy cream if you’d like to make an extra indulgent quiche). Add a pinch of cayenne, a few turns of cracked pepper, and a little Kosher salt. Once the bacon and onions are done, stir them into the custard along with the Sargento Shredded Swiss cheese and half the Sargento Shaved Parmesan. Pour the custard into a buttered pan and scatter the remaining Parmesan on top. Place in the oven and bake. That’s it! A simple and delicious gluten free quiche recipe! Can you Make Crustless Quiche Ahead of Time? One of the many benefits of going crustless is that this quiche is super easy to prepare in advance. Simply follow all the instructions, add the custard to the pan, and refrigerate until morning. The quiche can be baked as usual, though it may need a few extra minutes of baking time. Alternatively, you can bake the quiche, refrigerate overnight, and reheat in the morning. To reheat crustless quiche, remove the pan from the fridge while the oven preheats so it can come up to room temperature. Cover with foil and bake at 350 degrees until warmed through (usually about 20-25 minutes). How Long Does Quiche Last? I find crustless quiches last even longer than their traditional counterparts, namely because you don’t have to worry about a crust getting soggy. 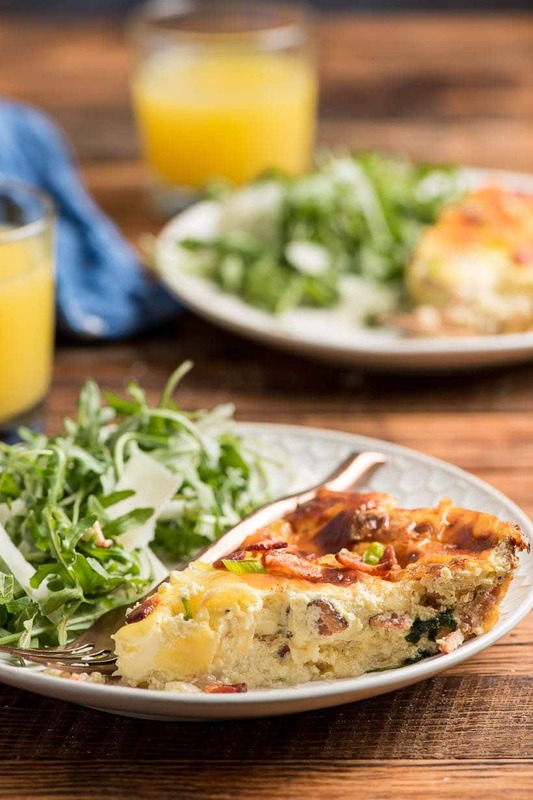 This Crustless Quiche Lorraine will easily keep for 3-4 days. We enjoyed the leftovers for breakfast, lunch, and even one midnight snack. 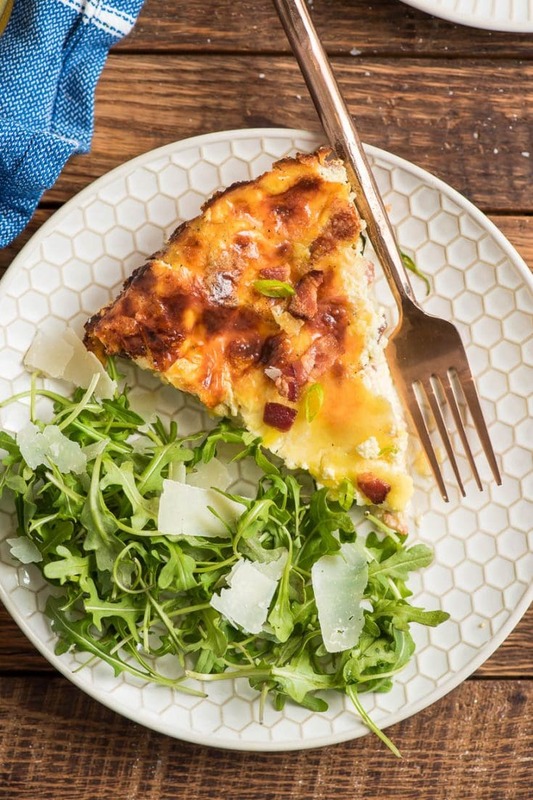 The quiche can be enjoyed hot, room temperature, or even cold, making it perfect for lazy brunches or open houses where people are coming and going over a few hours. 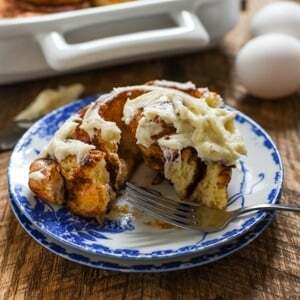 It can be the star of an Easter brunch, but it works equally well for bridal showers, baby showers, or a quick weeknight dinner. 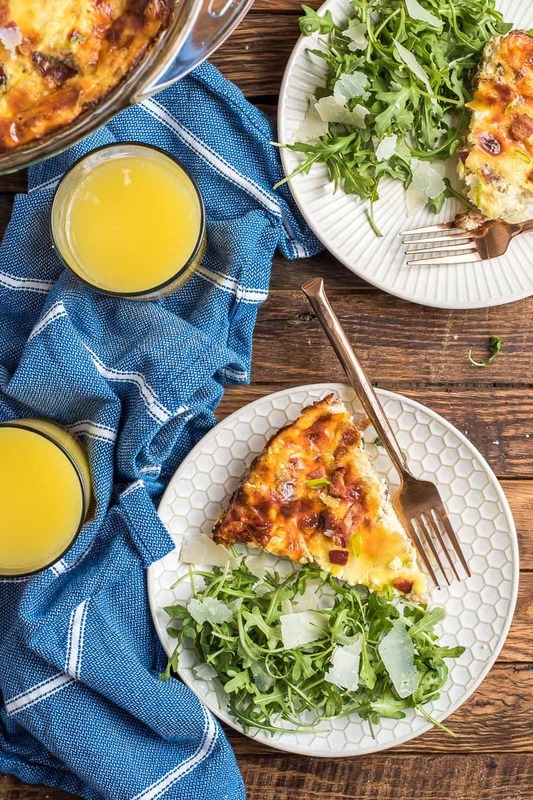 My favorite accompaniment to a Crustless Quiche Lorraine is a simple arugula salad topped with a lemon garlic vinaigrette (the one used in That Good Salad is perfect) and, you guessed it, more Sargento Shaved Parmesan. Other favorite sides for quiche include Roasted Rosemary Potatoes, The Best Sour Cream Banana Bread, Lemon Blueberry Crumb Bread, and Honey Lime Fruit Salad. You can find all of Sargento’s new cheeses (which include an aged cheddar and gouda) at Meijer in their dairy section. Meijer is my go-to one stop shop for all my groceries. You can pick up all the ingredients for this quiche recipe at Meijer, and, if you’re anything like me, you’ll probably walk out with some new clothes for the kiddo, a decorative sign for the house, and a slew of Easter decorations as well. 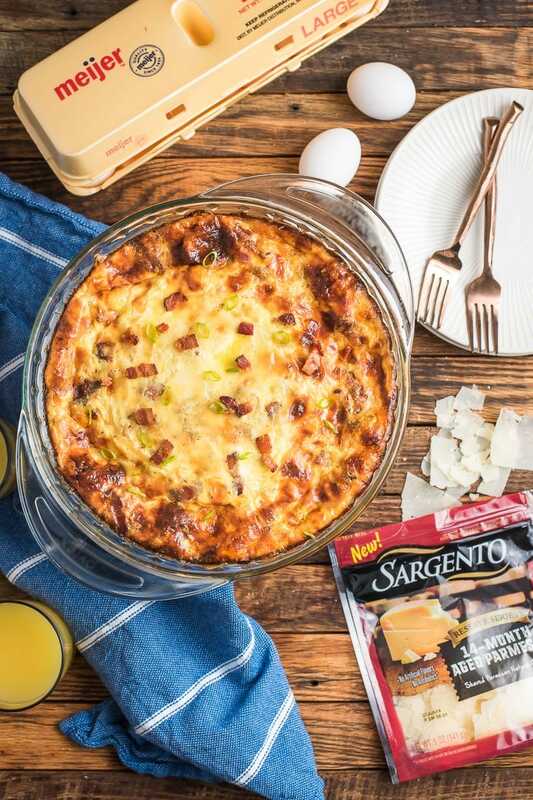 Right now, you can save $.75 cents off 1 Sargento Shredded Cheese Package at Meijer, so it’s a great time to stock up and try this recipe at home! Crustless Quiche Lorraine is an easy gluten free quiche recipe that's perfect for a busy weeknight dinner or casual brunch. Packed with bacon, onions, Swiss cheese, and Parmesan, this recipe is always a crowd pleaser! Preheat the oven to 375 degrees. Grease a 9 inch deep dish pie plate with butter. In a frying pan over medium heat, fry the bacon until crisp. Remove to a paper towel lined paper plate and allow the grease to drain. Remove all but 1/2 Tablespoon of the grease from the frying pan. Add the onion and saute until soft and golden brown, about 7-8 minutes. Remove from the pan. In a bowl, whisk together the eggs, half and half, salt, cayenne, and pepper. Stir in the Swiss cheese, 1/4 cup of the Parmesan cheese, onion, and bacon. Pour the mixture into the prepared pan. Sprinkle with the remaining Parmesan. Bake for 35-45 minutes or until the quiche is golden brown and has just a slight jiggle in the center. Serve warm or at room temperature. To make this ahead of time, simply follow the instructions through step 4. Cover the pan with foil and carefully place it in the refrigerator. When ready to bake, remove the quiche from the fridge and allow it to come up to room temperature while the oven preheats. Remove the foil then bake as usual. Alternatively, you can bake the quiche as usual, allow to cool, then cover in foil and refrigerate until ready to serve. Reheat the quiche, covered in foil, in a 300 degree oven for approximately 20-25 minutes.